Recently we bought a new house for which we had to take a huge loan. We have already shifted and now trying to clear the loans as early as possible. What should I chant for attracting new sources of income for repayment and clearing the debts faster? Listen regularly to “TOGETHER CHANGE NOW” and “THE OPTIMIST” cds. I am not getting money from a person. Till now the idiot is not giving my money. Your anger or resentment against him works against receiving the money. Prosperity – Remains only with him who offers it to the Divine. Unselfish Prosperity –He who receives it abundantly gives all that he has, as he receives it. The flower teaches you prosperity consciousness – developing prosperity mentality inside you. Money as such is not prosperity. It is not ours. Even though we can handle money, we cannot claim any ownership on money. It is neither mine, nor yours. It belongs to the divine. Understanding this is ‘Prosperity Consciousness’. The divine is giving you money during certain times and taking it away during certain other times. Do we really have prosperity consciousness then? We – all of us – have – only poverty consciousness. Without understanding that money is a tool to handle life, we cannot do anything about the flow of money. Money is a Divine flow, which cannot be altered by the human. When one is not avaricious (highly greedy for money) he has prosperity consciousness. When one is not miserly, he has prosperity consciousness. When one is not longing to possess money or when one is generous or not mean-minded, he has prosperity consciousness. What does the Flower of Prosperity bring in us? What will it bring? It will not bring money. It will change your poverty mind to prosperity mind!!! When this happens, it will make you understand that money is universal, and it is a Divine flow, similar to the air (Prana) which is always available and over which you have no control. How and when to use the flower? How to use this flower to get money? What type of meditation can be helpful using this flower to get money for our requirements? The basic mistake all of us do when we have to pay our debts,when we have expenditure to make, or when we are hard-pressed for money is to concentrate and spend all our efforts in getting the money required. Our mind is looking for ways of receiving money either by hook or crook. When money is available as freely as “prana”, the underlying hidden message is “give and be given”. Meditate on this flower, allow it to fill up all your chakras and mentally start giving the money that you have to give. Mentally spend the money. Give all the money that you owe to others (when you are in debts). Mentally pay your children’s fees, if you need money for that. When you have lost money or when somebody is not giving money due to you, don’t think about the loss or him. Thank him. Pray for his wealth and goodness. Think why you need that money. If the money you want from him is for some expenses or for paying some of your debts, mentally pay them. Visualize the money flowing out through your hands to those whom you have to pay. Mentally fulfill all your money commitments daily, meditating on this flower. Don’t visualize getting money. Visualize giving money. If we observe this method, there is always prosperity. There is abundance always and happiness is for all. 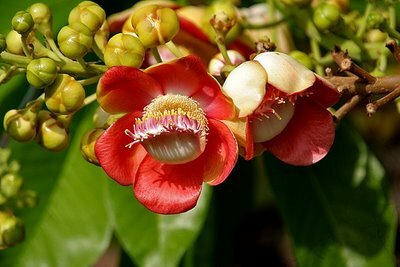 Thank you Mother, for opening us to the love, beauty and grace of this “Cannonball (Nagalinga)” flower!!! This flower energizes, activates our heart [give] and throat [surrender] chakras simultaneously. Let all of us keep this. Now, keeping this in mind, read the story of Krishna and Kuchela.